For the Shop Stool shown on page 18, I wanted a uniform!y<on-toured seat that's nearly impossible to get with hand tools. 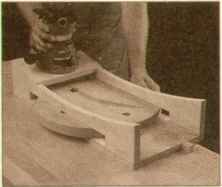 What I came up with was a way to shape the seat using a router and a special scooping jig. With this jig. the router moves like a pendulum — but it's not suspended from above. Instead, the router rides "roller coaster" rails over the workpiece. And the workpiece is rotated between cuts, see photos below. Openings in the side rails hold the seat blank down on the jig. ^ removable pivot pin keeps it from creeping. 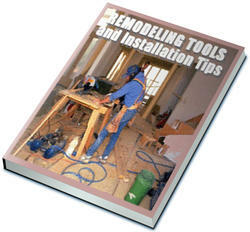 Your free hand prevents it from rotating asthe router cuts. Riding along the curved rails of the jig, the muter cuts more deeply into the center of the blank than the edges. This produces a smooth, uniformly-contoured seat. rail profile. When you use this seat scooping jig (or another like it for a different-siie seat) the shape of the profile on the side rails determines the shape of the contoured seat. The radius of the profile controls how deeply the router cuts. 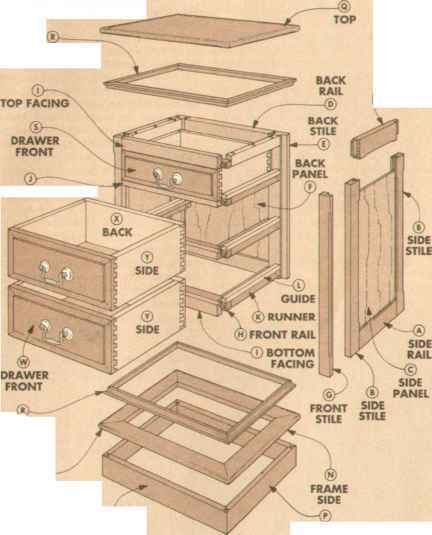 And a replacement base on the router keeps it on the rails and cutting in a straight line (see drawings below). opening.What makes this jig work so well are two features that control the workpiece. First, there's an opening for the seat blank on the bottom of each rail. So when the workpiece is slid into the jig (like putting bread in a toaster) it can't rise up as it's being shaped. 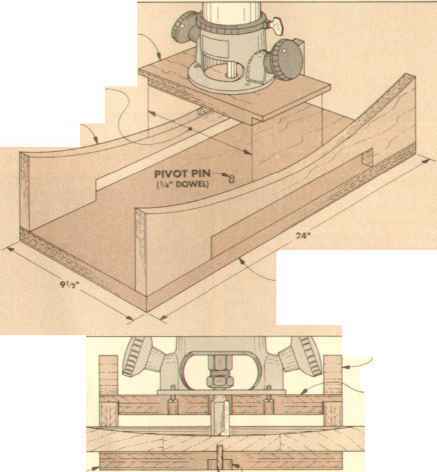 pivot pin. But the most important part of this jig is the smallest — the Vin dowel the workpiece pivots around. The dowel lets you rotate the workpiece between overlapping cuts, and also keeps the seat blank from creeping around on the platform as you rout. So what you end up with is a smoothly-contoured seat. How to router a seat base? 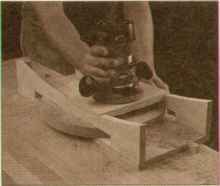 How to make a seatscoop jig for router?